This precious island of about 300 inhabitants with coasts of deep aquamarine waters is covered in secret caves and is by all accounts the most beautiful. Do not judge it by first appearances, as, beyond the concrete houses and a big hotel which are the first things you will notice at the port, the island has real charm. 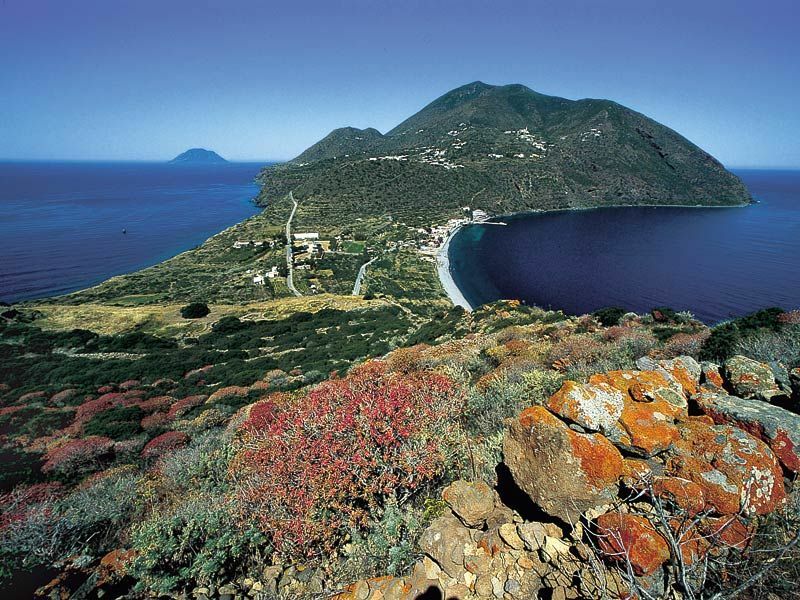 As soon as you leave the port all Filicudi’s beauty reveals itself and will have you enchanted immediately. Its main road leads to Capo Graziano in the south and the prehistoric village dating back to the Bronze Age. The little settlement which was discovered in the 50s is even older than Panarea’s prehistoric village in Punta Milazzese. 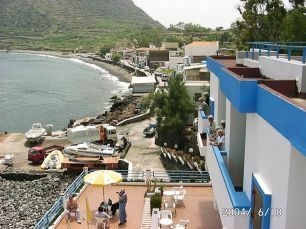 Filicudi has only one beach which is considered to be an "actual" beach. It lies some steps from the village and is a typical pebble beach. The other “beaches “ can only be reached crossing rough and sharp rocks or if you hire a boat. From the port some steep stairs lead you to the heart of Filicudi. Continue for 10 minutes until the road divides. From here if you head right you will come to Valdichiesa. It is a small village where there is a nice church sitting on a hill. The village is lorded over by the highest peak on the island, Fossa dei Felci (reaching 774 m at its summit), popular amongst trekkers. If you head left at the crossroads there is a narrow lane which leads to Pecorini. It is simply a cluster of one storeyed houses set close together round the chiesa (church). This hamlet affords a couple of restaurants and a coastline suitable for bathing. Off the port it is possible to rent boats, if you want to see all around the island. A trip may cost about € 20 per person for two hours in the summer season. 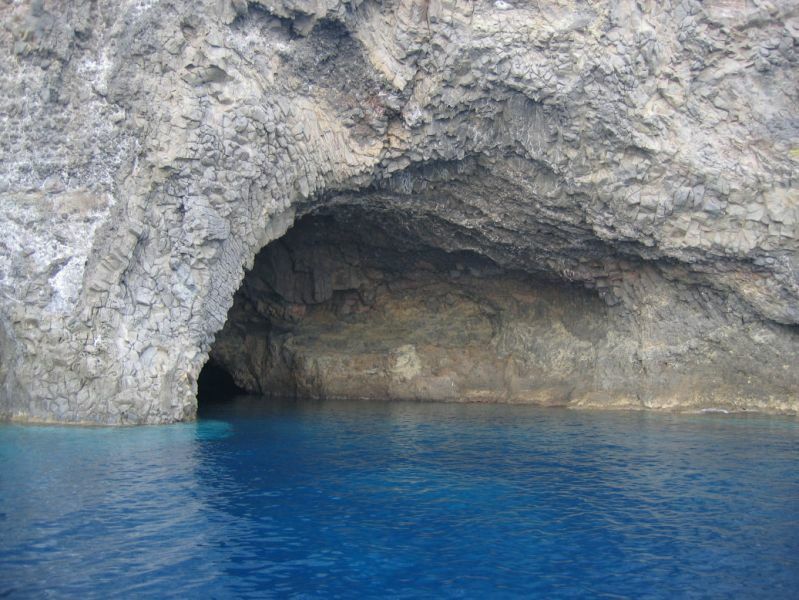 On the west of Filicudi, remaining uninhabited for the most part, is Punta del Perciato and the Grotta del Bue Marino. This cave was the natural habitat of seals (the reason for its name). Unfortunately the seals died out back in the 60s. All that remains today is the bluish green water shimmering in the sunshine. The Scoglio della Canna (Cane Reef) lies in the north west of Filicudi. This lofty pile of rocks of 71 metres of height is an admirable faraglioni. Hotel La Canna on Via Rosa has a good quality restaurant serving homey dishes. You will need a reservation. Villa La Rosa also on Via Rosa serves delectable food and even has a disco- the only place for nightlife on the island. Pensione La Sirena on Via Pecorini Mare has an attached trattoria. BY FERRY AND HYDROFOIL: ferries and hydrofoils serving the island practically disappear in the wintertime, while, in the summer services depend on the sea, cancelled if it is too rough. Siremar and Ustica Lines have established their offices on Via Porto parallel to the port. In the summer when the number of tourists increases dramatically there are three hydrofoils and one ferry a day.